The Azerbaijani-American Youth Association is starting a new initiative global project around the Karabakh conflict. 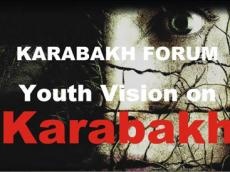 Within the project will be organized Karabakh Forums in various countries of the world, the Association reported. The first Karabakh Forum will be organized in US, Washington DC and will be attended by the representatives of think-tanks, NGOs and experts on the conflict. The US-Karabakh Forum will be organized on 27 April in Washington DC and during the meeting will be presentation of the youth view on Karabakh conflict. The new platform is launched for organizing discussion forums among the international youth, experts and journalists on the current status of the resolution of the Nagorno Karabakh conflict between Armenia and Azerbaijan, the role of young people from both sides and their efforts in achieving peace in the region and develop civil society dialogue among the conflict sides. The project is supported by the State Support Council to NGOs under the President of Azerbaijan Republic. The project will provide awareness activity in United States about the Karabakh conflict and to involve experts on conflict and youth workers to discuss the resolution of this conflict and introduce to international audience the Azerbaijani youth view on this problem. After the Washington Forum, Organization is planning to continue discussion Forums in Brussels, London, Berlin, Strasbourg, Vienna, Roma, Bucharest, Moscow and Istanbul through the 2012 and 2013 year.